How do I know that the fruit and vegetables will be fresh and of the best quality? We grow a lot of our produce ourselves and we also source from other local farms in our areas. What we can't buy locally we buy from the Brisbane Fruit and Vegetable markets every week. We select the products ourselves, so we select only the best quality products. What if I live outside the designated delivery area? Please phone us to obtain a quote on delivery costs outside the designated area. When do I have to have my order placed by? All orders need to be placed by midday Friday for Delivery on Monday or Wednesday. What happens if I order products after Midday Friday? If your order is placed after midday Friday, your order will be processed with orders in the following week. All orders will be delivered on a Monday and Wednesday. What happens if the delivery day of Monday doesn't suit me? Delivery is also avalable on A Wednesday. What if I can't order the products online, can I do a phone order? Yes, call us so we can let you vebally know if the product is available or a replacement. How do I get a refund on a product I'm not satisfied with? Your money can be refunded as a direct credit to your bank account or your money back on your next delivery. Where is the majority of the produce grown? How does the fruit & veg ordering work? Visit our Getting Started Page. Pick your box, add your delivery details, pay and Presto! How does our fruit & veg compare to a supermarket or fruit shop? Fresh is Best! Some fruit and veg can sit for up to 10 months before a supermarket will even display it for us to purchase. Our fresh fruit and Veg have just been harvested. Straight from the farm to you! Can you modify, pause or stop your fruit & veg delivery? Am I locked into a contract? No contract. You can pause or stop your deiveries at any time. How are my fruit & veg delivered? 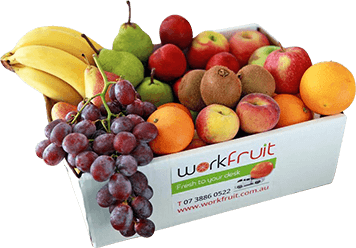 Our trusted and dedicated drivers will deliver the produce direct to your workplace or home. 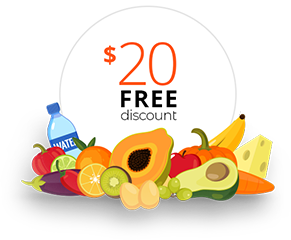 Delivery cost is incuded in the purchase of your fruit, Veggie or Juice box. What is the cost of a minimum order? The minimum order is $35. Our couples box. Can we collect and reuse the old delivery boxes? Due to the health and safety of all of our customers we are unable to reuse the delivery boxes. But the boxes are environmentally friendly and made of good quality cardboard. So if you don't have a use for them we encourage you to recycle them. Will the price of my order change? The price wil only change if you change the delivery box type. Fruit and Vegetables are seasonal so the contents of the box will change through the seasons. We will ensure all our customers are told of such changes. Via our online payment system. Credit or Debit Card. We wil notify you and ask for a new card for payment.